I think the highlight of my Christmas dinner this year was when I entered the family kitchen, where I arrive bearing the dessert, and promptly dropped the the whole thing on the floor, where it shattered into a million pieces. I sighed, and guessed it was a fitting end to a fragmented year. Having seen more than my share of kitchen catastrophes in my time in various professional kitchens, like getting yourself stuck in a traffic jam, there’s not much you can do once the damage has been done and I’m glad that I’m able to laugh them off. This year, one of my catastrophic ideas was to tackle granola bars. I see recipes out there all the time—usually some sort of combination of oats, dried fruits, sometimes nuts, and invariably lots of sweeteners to hold everything together. I wanted to make a bar that was really grainy and nutty, without being overly chewy or sugary, but not one of my experiments turned out as I expected. And what I was left with after each of my attempts was a cutting board with some combination of oaty crumbs, miscellaneous dried fruits, dried out seeds of some sort, and a wounded ego. But aside from my granola bars not working out – despite my best efforts, 2011 seemed like a pretty tough year outside of my kitchen as well. There was good news and bad from our neighbors in the Middle East, natural (and unnatural) catastrophes in Japan, we saw the continued polarization of America (which makes me wonder how much longer we’re going to be able to use the word “indivisible” in our pledge of allegiance to each other), as well as a topsy-turvy financial roller-coaster that wound its way around the globe. One thing I think we can all agree on in America is the proliferation of what are called “energy bars.” As far as I know, no research exists that conclusively proves that these bars, many with the same ingredients in regular candy bars and the same number of calories as a Snickers bar, are any better or worse for you than a tablet of good chocolate. However I will just assume that all the oats and dried fruit make up for the overload of sweetness in some of them, and because they’re handy for travel and so forth (and because I am a sucker for the promise of marshmallows, peanut butter, and chocolate chips as being part of a healthy snack), they get a pass. What I can’t forgive them for are their dense, dough-like texture. And although I still grab a Clif bar whenever I’m back in the states and taking a plane, I’ve brought them back to Paris and stuffed them into my kitchen cabinet for a future trip. But then, I’ll come across one of those chocolate chip-peanut butter or Smores bars whose expiration date had passed and pause before tossing it out. Fortunately that didn’t happen – well, the Catherine Deneuve walking in on me part – but what also didn’t happen was me finding the perfect granola bar in 2011. But in terms of granola bars, now that we’ve reached the end of 2011, I’ve given up the idea, dragged my “Granola Bar” file into the trash…and am moving on. Not because I don’t like granola, or granola bars – especially the ones with any combination of chocolate, peanut butter, and marshmallows in them – but because it’s the end of the year and I’ve decided to start 2012 with a fresh, clean cutting board. Lord knows, I’ve got plenty on my plate, or cutting board, and sometimes we cobble together what we do have, even if it’s not picture-perfect, and make it work. Or realize that sometimes, well…that’s just the way the granola bar crumbles. And that’s that. And when it does, it’s okay to just wipe the board clean, and start anew. Look on the bright side, David! This way you have a goal for 2012. May it turn out to be a year as perfect and tasteful as your other recipes. I’ve never been able to master loose granola. What I make tastes good, but never comes together in those nice clusters you get in premade granola. My cranberry, pecan, and semi-sweet chocolate idea was so good, but still not quite what I was going for texturally. David, I’m surprised that you have kept your sanity despite all the calamities. I’ve done the fetal position so many times in the middle of my kitchen from cooking mishaps. I can’t imagine working in a kitchen without falling to pieces. Then again, I’m also surprised the U.S. has not fallen to pieces yet. Well, the French say it best: C’est la vie! I tried and tried to get granola to work but it only turned out rubbery, chewy and tough. I finally decided to leave out the sweetener and oil and add the sweetener right before I eat it along with milk and fruit. The recipe uses mixed oats, almonds, lots of all kinds of seeds, orange juice, zest, and vanilla. I bake it and comes out crispy which I like. 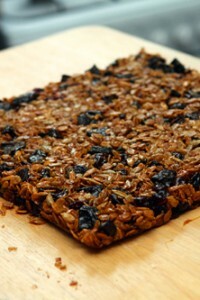 I wonder if you could bake the granola mixture and then add the binder later like you do rice crispy treats? You probably tried that though. I am not a huge granola fan but you made me laugh and that is a gift beyond reckoning. Your posts are always informative and entertaining. Thank you and blessings to you in the new year! Are you familiar with the British flapjack? Delicious and they always seemed more life sustaining than the American granola bars. You realize that now you’re going to get a ton of granola bar recipes, don’t you? The dessert crashing to the floor? Loved it (and I’m sorry). I see someone else has already mentioned what I was going to – flapjacks! Bought ones are invariably too sweet, but they are easy to make. Your basic combination is oats, demerara (turbinado) sugar and butter…. melt the latter two together, stir in the former, spread on greased tray to thickness of your choice and bake until done. It’s quite hard not to let them burn, though, so thicker rather than thinner. And if they are really, really good, you could always top with a layer of melted dark chocolate…. Many people’s recipes for flapjack involve golden syrup, which I dislike, and which is really unnecessary! I have experimented with honey, though, and also mashed banana and peanut butter stirred into the melted mixture, which was really rather good…. David, I cannot make beautiful cakes as you do…even weighing out the gluten free flours to translate the recipes in your books…I have to leave gluten-free cake making to the professionals – they just never live up to my hopes and dreams. 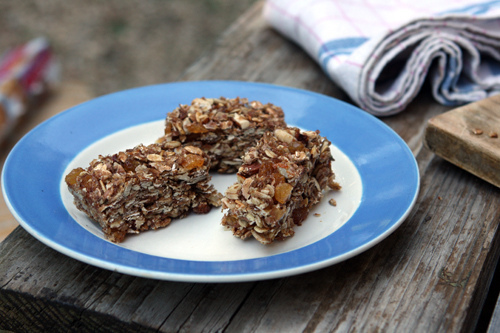 But granola bars – those are my specialty….mine do have a heavy load of sweeteners – I use a mixture of brown rice syrup, honey, brown sugar…and bind that with butter, a dollop of nut butter and spices. My current favorite bars are a little more adult in profile – smoked paprika with pecans or cocoa coconut curry bars with ginger. Next time you’re in Chicago, join me in the kitchen – you can fix my cake techniques, and I’ll tune up your granola bars. Happy New Year – thanks for another year of beautiful stories, recipes and photos! you know that fruitcake bar you posted twice about? they’re much better than any energy bar i’ve seen on the market. 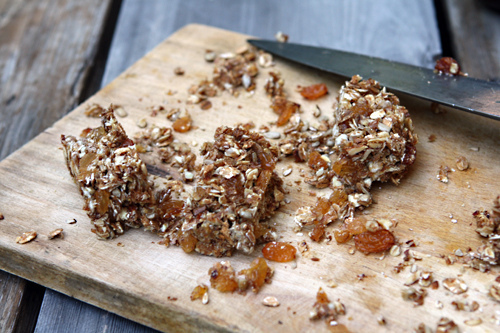 i’ve made a couple of versions using local dried fruits and other bits and they are a hit! been considering making another version with rolled oats and coconut flakes… i’ll bet they are yummy! Agh! I kept thinking you were setting us up for a switcheroo in which you revealed the recipe for THE PERFECT GRANOLA BAR. But that’s the ol’ American penchant for Hollywood endings. Great post, David. Thanks for another year of entertaining, informative, and inspiring reading and recipes. Here’s to another. Happy 2012! I think your habit of packing nuts and dried fruit for a trip is already light years ahead of all these so-called energy bars. The fruitcake bars you posted last year (?) would be a treat to anyone ravening in an airport. The granola can stay its crumbly self – it seems to want to anyway – and you’re still here and ready for what’s next. Happy New Year – I hope it’s a good one! Fitting new year speech! Wipe it clean and move on. I have not been able to find any that I like in packages and I dont even attempt to make them. And once I eat, I get this itch that I have to floss my teeth due to the sticky suckers in the bar. I do agree with the American politics. I got my citizenship last year and I was so happy that I could finally vote after ten years in the States. But I am disgusted with the politics more and more now. I echo Stacy “… you made me laugh and that is a gift beyond reckoning. Your posts are always informative and entertaining. Thank you and blessings to you in the new year!” I think you are both eloquent. Very best to you for 2012. Ah, David, A zen moment at the end of the year. It’s good to “let go”. The cereal bars made by Jordans (of Original Crunchy for “the munchies” fame) in the UK seem okay to me, better than anything I’ve had in the US. They’ve been making them for over thirty years and I haven’t grown tired of them yet. happy new year david. thanks for a year filled with delicious fun and info. Perhaps, take a look at some Pan Forte recipes: the medieval power bar! David, I’m so sorry about your Christmas dessert and the failed granola bars. You work so hard and it must have been so disappointing to have that happen to you especially at Christmas when you expect that everything will be happy and perfect. I hope you can get some much needed rest and encouragement and have a better 2012. Paris is always so beautiful in the springtime! PS, I was thinking about the video you posted a few weeks ago and how delicious the sardine pate was that you showed us how to make. And I made it with the wonderful furikake you recommended — I had never heard of that…now it’s a great addition to my kitchen. In the end, it’s not the end of the world and it’s just food. And while it’s annoying to lose something, it’s not the fin du monde (end of the world). Sometimes giving up on a problem gives our brains the space to come up with a solution…or not. I personally am giving up on trying to make agar-agar work in gelatin desserts. By the way, this New Year’s Eve dessert is thanks to you: Profiteroles with coffee ice cream, salted butter caramel sauce, and French candied almonds from The Perfect Scoop. Oh, and a Maida Heatter fudge sauce–no offense. I will be extra careful carrying the platter to the table. 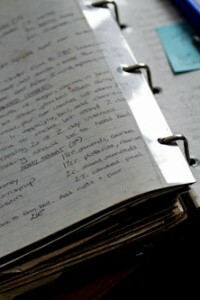 Thanks for the great writing, photography, and recipes in 2011–all the best in 2012! I, too, long for a truly healthy snack bar– one that is low calorie, filling, and packed with nutrients. Then again, I also long to be tall and thin. Happy New Year, my friend. I hope the year ahead brings all good things– including challenges you meet and those you are wise enough to walk away from. David, Saw that you want masa harina for your homemade tortillas (date bar post). I can bring some to you next week. Let me know and I will haul it to Paris. I love you David. All the best for 2012!!! I had the same experience when I attempted granola bars this year as well. I was left with a pile of, well, granola. I was pretty bummed, but my spirits were lifted when my mom (gotta love moms) said the crumble was delicious! So we grabbed spoons and dug in! I hope you have a lovely 2012! Thank you for another year of inspiration David! I am making your salad nicoise to go with the NYE pizza and baking your banana cake with chocolate frosting for the feast tomorrow. All best to you in 2012 – slaud, amor & dinero! I will eat anything that says “healthy marshmallows and chocolate.” Even if they took a trip to the floor. Happy 2012, David, and thank you for the entertainment and education! I love the idea of letting something go with the passing of the old year. And vive chocolate bars! Happy New Year! I hope next year is wonderful for you. Drop Christmas dessert on the floor, yikes that was a bad year ending. Our Christmas had many sweets as well so I guess missing one wouldn’t be so bad but one of yours would be horrible. I understand about the granola bar conundrum. The ones here use a lot of corn syrup and glucose to hold them together for that pull apart sweetness. I found that a combination of almond butter and honey worked well for my bars, then keeping the fruits out till the last minute to prevent those tooth breaking chunks. Looking forward to following your granola bar quest this year. Another vote here for your fruitcake bars! I’ll take them any day over a crumbly, dry, too sweet energy bar. Add some chocolate, and wow! Feliz y próspero año nuevo 2012! Many thanks for another year of wonderful, funny, informative posts. I often wonder how you work in any sleep time with all you are up to. Best wishes for a fruitful, dessertful 2012. Never underestimate the power of the Clif. I should be ashamed that the 25 year old college student in our midst eats one five days a week while by-passing all sorts of delectable things created by me, but really I’m not. They get him out of the door when combined with an elaborate fruit smoothie that I make for him (that included cooked oatmeal, which makes it very smooth and nice) that takes me about 15 minutes to make for him. Well, I think it’s wise to move on from granola bars. They are too high in carbs and not worth the calories, as far as I’m concerned. Your caramel/salt ice cream with the shards of carmel in it is quite another thing altogether and worth every last cream and sugar blessed calorie. I made it for Christmas/Chanuka dessert for my family and had the foresight to make two batches because everyone loved it and went back for seconds. I have no experience with granola recipes. However, it being New Year’s Eve I wanted to thank you for your blog this past year. I discovered your writing in 2011 and always look forward to reading your latest entry. Love the “foodie” metaphor–a “clean cutting board”, instead of a “clean slate”. I’m going to use that one! I say skip the granola bars and just eat the granola. Alton Brown has a recipe that I use all the time for granola….it’s easily found on-line. The only change I make is to add dried cranberries in place of the raisins he suggests. Thank you for this entertaining and helpful blog, David. Looking forward to your 2012 posts. Happy New Year to all. Peace and love. We would love to have you visit us and who knows, maybe you would get a great idea for a cookbook!! I was in San Antonio this year, doing classes at Central Market with their amazing citrus. And don’t worry; I ate plenty of bbq, and Tex-Mex foods – and came back with a few treats in my suitcase, too. David, a question off the subject of this blog…do you have any ideas for where in Paris I could find one of the blue steel type madeleine pans? I understand they are the ones that get the madeleines more browned and with crispy edges. I did not see any in E. Dehellerin when I was there. What kind do you think work the best? So glad to know it’s not just me who’ve suffered some cooking disasters. I’ve totally lost my roll dough mojo and have just had to ride above–small pun. Here’s to a better 2012! Macarons are my granola bar…… so close but just not right……. haven’t been able to give up on them yet. Happy New Year David! Will be looking forward to your recipes and stories. It has infinite possibilities of combinations and tackles the “glue” that’s needed to hold the bars together. On another note – America may look pretty dismal when viewed from across the atlantic, but from where i live in New Paltz NY there is a lot of hope, lots of young energized people, lots to look forward to…and the world is still a beautiful place. Happy New Year! The healthier the granola bar the less I like it… Forget the super-charged protein missiles that settle in my stomach like a food-version of the titanic… True I’m not hungry after one, but I also don’t feel well. I’m wondering if it’s just better to stick with nuts oats, bits of dark chocolate and fruit… Oh right… someone already came up with that one– trail mix. Happy and Healthy New Year. I don’t know how they make them, but the flapjacks and the granola bars at Fleet River Bakery in London are the absolute best — probably because they’re a little more like cookies than just oats and fruit and nuts. I requested the recipe but didn’t even get a word back from them. Next time you’re in London, you must try them. And see if you can wrangle the recipes from them. They’ll completely change your mind about granola bars. Unfortunately, I live in California, so I don’t think I’ll be there any time soon. I am SO glad you posted this. I have tried and tried to devise a good granola bar and have failed miserably every time. I’ve given up now and occasionally create a cookie that’s “in the granola bar spirit.”-I think the manufacturers must have some secret cement to make theirs hold together. I’ve also concluded from several failed experiments that “healthful” and granola bar simply can’t coexist–the only results even verging on edible were far to fatty, salty, and full of calories to fit in the nutrition-wise category. If you get a chance drop by–just posted on 2011 food trends I’m happy to say goodbye to. No worries. Your cookies or ice cream or savory recipes will sustain! 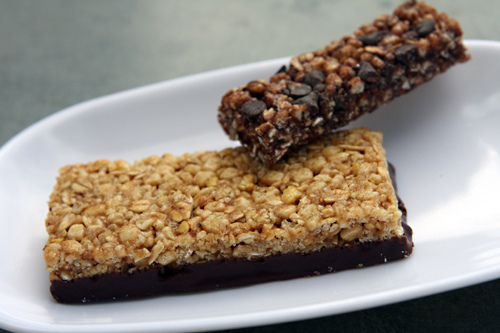 ‘Kind’ bars at the local health food store are prett darned good if one insists on an edible bar. Happy New Year from the high plains, y’all. I was so relieved by the absence of a recipe! I usually take my Nonna’s biscotti and some cheese when I travel. I hear you David. I’ve been trying this year to get my granola recipe to where I like it, without success. Ah well, I’m not giving up quite yet. Happy New Year! I can’t make flapjacks so have never attempted granola bars (which are just granola bars in basic form!). However, it took me 10 years to make meringue successfully, I don’t know why it was so difficult because now it always works! So if 2011, wasn’t the year, you conquered granola bars but there will be a year you do! For what it’s worth this year, because of you, I made cherry jam, thank you for that, it was amazing!! Have you tried binding them in caramel instead of Karo and honey? Bingo. Ah, being a chocolatier, I, too, am familiar with dismal failures in my kitchen. Amazingly, I keep going back for more. The price of a passion, I guess. 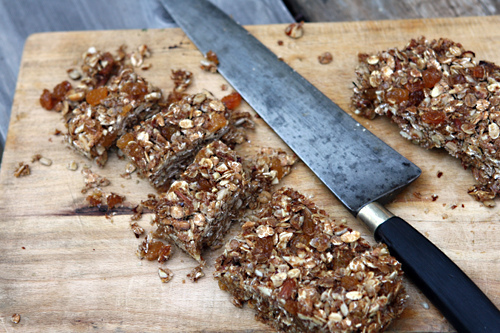 If there is a next time and If any of those granola bar pieces are hygenically edible (who’ll know?, per Julia Child) scoop them up and make a happy-mistake bark. Though I have most of your books, I only discovered your blog mid year, and it’s brightened up many a day. Thank you for sharing your delicious experiences, recipes, laughs and insights. Keep them coming, tho I, too, don’t know how you manage to do it all. Chocolatiers make a lot of mistakes. One Parisian chocolatier told me he spent 6 months trying to figure out how to make one of his collections of chocolates. I was once in a chocolate factory in the US and a crew was opening a mountain of boxes, filled with chocolate bars, and unwrapped each one. Apparently the tempering machine wasn’t working correctly or something and all of them had to be re-melted and remade. The chocolate company was over 100 years old, so if they can goof, the rest of us shouldn’t feel so bad when it happens to us, too. David, sorry about your Christmas dessert :( I have had one failure after another in the kitchen this month and had been feeling quite defeated. Thanks for lifting my spirts and allowing me to realize that everyone (even professionals like yourself) don’t always have perfect recipes. I hope you have a wonderful New Year and I look forward to reading your new posts in 2012! Hey, since you’ve put your quest for the perfect granola or energy bar on the back burner for awhile, try the granola bars from Smittenkitchen. I use dried tart cherries, walnuts, pecans, coconut, oats, oatbran, and wheat germ for the dry, and peanut butter, butter, honey and maple syrup for the wet ingredients. Need I say more? Happy New Year! Looking forward to your 2012 posts! All the best for 2012! Thank you for your wonderful work: I have learned so much from reading your posts, including how best to create and maintain a running blog. You are incredibly hardworking, reliable, informative, enjoyable and funny! Again, thank you so much! Thanks for all of your posts this past year David! I look forward to reading them as they always make me smile! I’m sorry about your Christmas dessert – it happens to the best of us! Have a Happy New Year!! Grateful for all you’ve shared this year. I’ve stretched my boundaries with your dependable instructions. As long as there’s chocolate in this world I see no need for a granola bar. wow, it seems your granola bar year is a bit of a metaphor for life in general. like everything else, the granola bars will end up to be only a miniscule frustration, so who needs them anyway? bettter things to come. besides, clif makes a pretty good new bar, called the mojo bar. no on marshmallows, but yes on pretzels and chocolate and nuts. :) happy new year! Your granola bars look pretty darn tasty to me…crumbs happen. Yeah, sometimes the best advice is, if you don’t succeed, just quit. I just read the wonderful cookbook/memoir Beyond the Great Wall. The authors say they are not including the recipe for those long noodles that are pulled between two hands again and again because they can’t figure out how to do it themselves. Isn’t honesty wonderful? I think the end of the year is a good time to get rid of things you don’t use. I just donated 3 bags of towels to a feral cat rescuer. It’s a lot harder to get rid of kitchen utensils, however. That’s right. Some foods you just can’t recreate at home, or make in home-sized batches. And things like those long hand-pulled noodles (like macarons, to some extent) are more about technique than an actual recipe, and it’s something that needs to be learned. After writing a number of cookbooks, and testing a whole lot of recipes, I’ve learned that after a few tries, if something isn’t working, perhaps it’s best to move on to something else..
You are one of the few passionate souls on the web who truly understands food. You have a natural grace and a way of presenting your creations with casual elegance. Thank you for all of your posts, they are at once witty, humble and inspiring. I wish you a new year filled with energy, hope and love. Happy New Year, David! You always have such great, passionate stories and posts that always make me smile. I hope your 2012 goes wonderfully! Happy new year,David! All the best.. 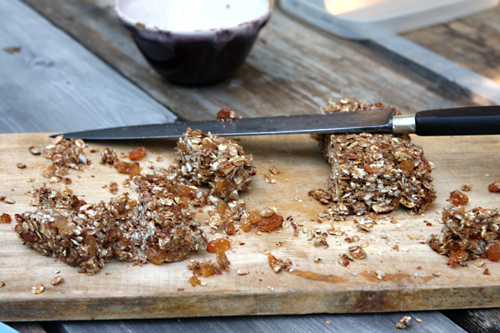 If anyone’s after a fab “energy bar” slice, I’m in love with this Cardamom Oat Slice. After spending a semester cooking with students in our Indonesian language classes, I had a lot of leftover Australian-Indonesian ingredients (they had to re-invent the ANZAC biscuit!). This slice used them up nicely and has since become a staple! But I don’t want to see an ANZAC biscuit again any time soon. I love that you threw out the granola bar file. For many reasons. So many of the American “energy” bars contain soy protein, which, as it happens, I am highly intolerant of (indeed, the Clif website has an entire “allergy reference table”). If I eat those bars, well, I’ll spare you the details. Even if you didn’t find success, I’m so glad none of your granola bar attempts included soy! New Year’s Eve brought out a similar urge here – I spent the better part of the day clearing out “the old”, “the worn” and the “never gonna happen”. Then, I saged my apartment to be sure even the essence of those was gone. One of the good things about cooking for yourself, is that you know what’s going in to what you’re making – so for those with food intolerances (and thanks for sparing the details!) you can be reasonably sure of what you’re eating. Sorry we won’t be spending time on any beaches this year, but with a clean cutting board, I’ve got my work cut out for me with a roster of new projects, and recipes! Congrats on Saveur Magazine’s best professional 2011 blog award — I certainly agree with that! I thought you said you never win anything…. 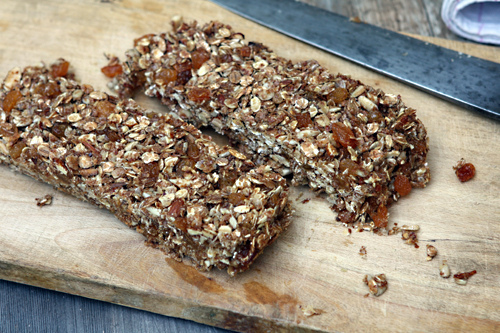 You now have 5 million new suggestions for granola bars– but nigella lawson’s is great! Or, Kashi GoLean crunchy bars, and Luna bars are both awesome high protein & refined sugar free bars that are not bloblike. Happy 2012, David, and thanks for all of your generous blog entries this year. I read every one! I am still using your great caramel recipe with a little variation. It is the best. I’ve tried many many bars and your fruitcake (friendship) bars are my favorite. Have you tried looking up recipes for “Museli bars”? That seems to be our version of the granola bar you’re talking about, but definitely doesn’t have a dough-like texture. It’s more crunchy and chewy. Tastes like it’s held together with a mixture of golden syrup and honey, if that helps. 2011 was the worst year of my life. I am symbolically throwing out all the disasters of the year with your failed granola bar experiments. May they all be soon forgotten! I’ll take your word that those bars aren’t great, but they look pretty good to me. Wishing you a happy new year and many, many scrumptious granola bars, or whatever else you hope for in 2012! I’m thinking some of the speculoos (sp?) spread and some dates (cooked in some butter (and brandy, maybe)) might help hold the bars together better. P.S. I made chocolate chip cookies from your recipe and they were divine! Thank goodness they turned out for me. They were a big hit with everybody. Merci beaucoup! “expiration dates are sometimes ‘suggestions’” Funny…and very true. How come so many items must be used 7 days after being opened? Why not 6 or 8 days? Oh! Because 7 days is a calendar week. How convenient. Wishing you a fabulous year David! So after all these beautiful pictures of granola bars, no recipe? I don’t know how they taste, but they look good to me. I love the Fruitcake Bar recipe you posted a while back so so much, and for me, it’s in the same family as the granola bar. Good luck with whatever you decide to tackle with your clean cutting board! I just bring my loose non sugar granola using a jar or a bag and eat it with a spoon. Healthy is more important than the bar. Love your video! I have been baking up side down apple cake using your up side down cake recipe for a week. My kids ask for it every day. I use 1/3 of sugar required. If you’re looking for an airplane snack you should try Alice Medrich’s wonderful honey hemp bars from her Chewy Gooey book. Love reading your blog, David. with the back of a spoon. Bake for 20-30 minutes until golden brown. Allow to cool and then break into chunks. If you mix it frequently during cooking time, breaking it up, use it as a breakfast cereal. > You’ll find all the unusual ingredients in healthfood shops. least 70%), 1/2 cup dried cranberries, etc., etc. Happy New Year, David! I was delighted to watch you on ABC last night explaining why the French have banned ketchup in their schools.Keep on surprising us with your appearances. Love seeing you on TV! I had the same struggle this year. Didn’t give up yet though. I have an idea a bar that omits all the oats and for sticking the whole thing together with Renuka coconut cream. I’m going to try it as soon as I get home! Preheat oven to 350`. In a skillet, heat almond butter and banana on medium heat until smooth. Mix dry ingredients in a large bowl, then add banana mixture. Stir well with a fork and press into a sprayed, small rimmed sheet pan using plastic wrap. Bake 23 minutes. Cool and cut into bars. Enjoy! I love a good granola bar, until I look at the ingredient list and realize they aren’t really that healthy! I would have been happy to try any you deemed a success but can’t really blame you for throwing in the proverbial kitchen towel. Am looking forward to new projects you share with us – and hoping 2012 will be a better year in many ways. Re: your dessert mishap – have you seen the documentary “Kings of Pastry”? I’m getting caught up on the TiVo and just watched this documentary. David posted this program on his blog, so I’m pretty sure he has seen the spectacular sugar creation shatter into mostly dust. David, check these out http://www.chow.com/recipes/28752-figgy-fuel-bar. People are coming up with recipes for Larabars. You could make some killer ones! Personally, I’m a fan of minced dried fruit and chopped, salted nuts held together with just enough good quality unsweetened baking chocolate. 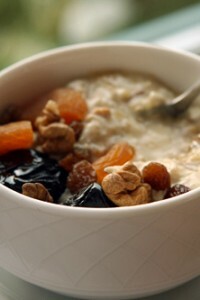 The slightly healthier version includes some sort of puffy crunchy whole grain breakfast cereal like brown rice krispies, pureed dates, a smidge of honey or fruit juice concentrate (cherry, pomegranite), and chopped nuts. They can be France or US sized. Give them a try one day… if you have a bit of cereal around. I gave up on the oat involvement years ago. haha, granola bars were on my to-try-list too this year. They’re not perfect yet but already proved far more popular then store bought during our ski trip last week! My recipe is based on Nigella Lawson’s recipe using condensed milk as ‘glue’. Besides that: oatmeal, dried cranberries and apricots, pecans, mixed seeds, dark chocolate chips and a little honey. I had to just laugh b/c my Christmas dessert had the same fate. I made your recipe for French tart dough in the oven- amazing! Then filled it with a chocolate ganache. I put it on a cake pedestal & stored it the outside fridge. After cooking a multi course meal for all my in laws, I go to present the final masterpiece. Kersplat, on the floor it went as I stepped into the dining room. No saving. I was heartbroken but a glass of vino ( or a few) later I had the thought- what a fitting end to a tough year. Thank you for all your recipes. I am a former NorCal resident with a love for travel & a passion for baking. Your recipes and blog write-ups are entertaining and tasty!